FORT RUCKER, Ala. (May 31, 2016) -- Although the day featured a mix of rain and shine, more than 1,000 people donned their swimsuits and sunscreen to take to Lake Tholocco's West Beach for one of the installation's most popular events. The Fort Rucker Directorate of Family, Morale, Welfare and Recreation's 15th annual Lake Fest returned to the waters of Lake Tholocco Saturday where Soldiers, families and civilians got their fill of sun, fun, food and festivities. Throughout the day, people were able to enjoy a car show, featuring makes and models throughout the decades; take a cruise around the lake with free paddle boat and canoe rentals; take part in a sand castle contest and frozen T-shirt contest; and satiate their competitive edge with a volleyball tournament. 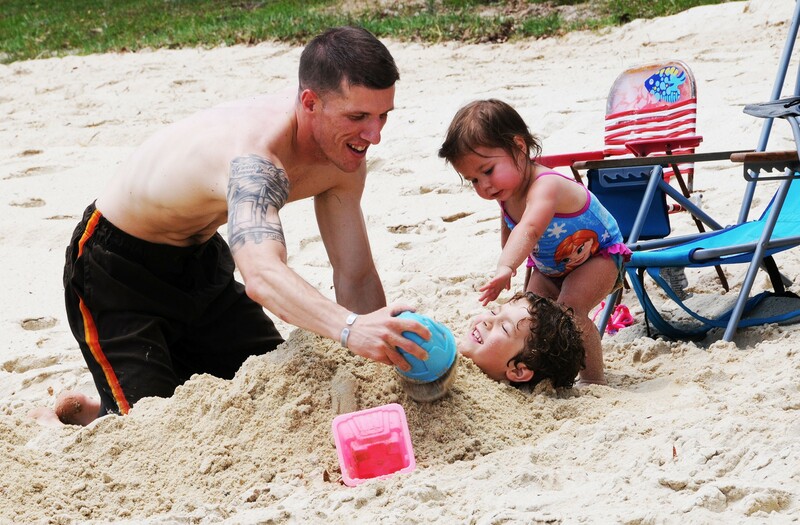 "Lake Fest is a great way to show the Soldiers, families and the community what DFMWR has to offer for a fun-filled day at the beach," said Kristi Fink, DFMWR special events coordinator. "This gives families a chance to spend some quality time together to get away from the daily routine, and there was something for everyone." Mikayla Stevens, military spouse, brought here children, Devon and Sarah, to enjoy what she called their first official "beach day of the year," and said she could think of no better place to spend it. "I just love that we have this available here on the installation because we don't have to travel too far to get to a beach," she said. "We've been waiting for the weather to warm up again so we can get some time in the sun." Stevens said one of her children's favorite pastimes is swimming, and that there is no better way to kick off swim season than in Fort Rucker's own Lake Tholocco. "They're always asking me where we can go swimming," she said. "I'll take them to the gym pool or even down to the beach in Florida if I have to, so I'm just glad that we all have a chance to get together and do this as a family." Swimming wasn't the only activity that was keeping people's attention. Jared and Melissa Tevebaugh, civilians, said they came out to Lake Fest not just to enjoy the sun and sand, but to see some classic and custom cars, and one vehicle had their undivided attention. "We wanted to come out and see the car show and look at what kind of custom vehicles people have in this area," said Jared, who admits to being an avid car nut. "I work on custom cars, but nothing like some of the stuff I've seen here." Jared was referring to one particular custom vehicle dubbed the T-Rex -- a customized Ford F-350, which included a tilt bed, tilt cowl hood, Lambo doors, semi wheels and tires, 28 air horns, four 200 psi air systems, electric retractable cover and seats that swivel outward to reveal an enormous 65-inch TV in the back. "That thing had me sitting there with my mouth open," he said. "It's really amazing what you can do to a car if you've got the time and money. Seeing that thing had to be one of the highlights of the day." From cars to canoes, people had their pick of recreational activities, and for many, like Melissa, it was the simple things like time on the water that gave them their fill of fun. "I thought the cars were nice, but it was the water that I came out for," she said. "Taking time to be able to go out onto the water and just relax a little bit is where my heart's really at when it comes to having a good time. "I'm glad that (West Beach) is out here for people to enjoy, and not just for the military," she said. "It really makes me feel like Fort Rucker is invested in their community, and that gives me a higher respect for the military community. They serve us overseas and in combat, as well as here at home, and that's something we really appreciate."